Poll results: Black is the new black! So, before the iPhone 7 was officially unveiled, we heard a lot of rumors about a new black color that's going to adorn the new Apple flagship. We even asked you in a poll whether you'd like to see a black or a blue one next, and the majority of voters pointed at stealthy, stealthy black. Little did we know that there would actually be two black variants unveiled! We assume that if you weren't entirely cut off from the Internet in the past week, you probably know this — the iPhone 7 and iPhone 7 Plus come in Black and Jet Black colors. The former is finished in matte, just like all the other iPhone colors, while the latter is glossy and shiny. There is no other major difference in the two, but it does seem like Apple considers the Jet Black edition to be the more "premium" one, since it will only be available in the more expensive storage options — 128 GB and 256 GB — while the regular Black will come in "pleb" 32 GB edition. So, storage and prices aside, we were just curious to see what you think about those two colors and which one you prefer. And, surprise surprise, 64% of voters chose the regular Black. The glossy Jet Black gathered just a bit more than 30%, with most users saying they'd prefer to stay away from it because it's a fingerprint magnet, could get scratched easily (confirmed by Apple), and kind of looks like plastic, at least in the promo shots. Around 6% voted that they'd stick with one of the other color options — Silver, Gold, or Rose Gold. Well, the day has come, folks — black is officially the new pink! 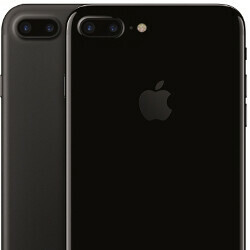 iPhone 7: Black or Jet Black? Regular Black all the way! The glossy Jet Black is my thing! Regular Black all the freaking way! Apple recommends that you put the glossy Jet Black in a case because the finish can be scratched. If you have to put it in a case, then what's the point? LOL. It is the only new thing about the iPhone 7 so obviously people are going to go for it. The iPhone 7 plus at least gets another camera, the regular model doesn't have any difference from the last iPhone. People will put both in a case for the most part. They will just by a clear case and call it a day! Nothing new really as most items that are glossy without any protective coating would end up with the same micro abrasions or"swirling" Matte paint or powder coating all the way. The feel in hand will prove otherwise. I think it will look more like ceramic. was a hard decision for me too but the scratch prone jet black took it away. look at cnets iphone 7 review and you can see the jetblack with a scratch on it. just takes the beauty away from it. I have always had black/dark colored android device (Galaxy S, S2, One X, Nexus 5, Nexus 7, OnePlus One) before gold 6SP...I'd try silver next time around. I am not buying 7 or 7P...and agree with statement in iPhone 7 review by The Verge - "...The entire time I was using the iPhone 7, I felt like I had a prototype of next year’s rumored drastic iPhone redesign disguised as an iPhone 6..."
The darker colors hid the antenna bands quite well and it was something I wanted to see on the iPhone 6s instead of that "space gray" option.